When guests arrive at a hotel, one of the first people they encounter is the front desk officer or clerk. If you work in this role, your position as the first point of contact for guests is one of the most important in the entire building. The guests' check-in experience can color their entire stay, so it’s important that you are friendly, professional and customer-service oriented as you greet guests and get them settled in their rooms. A front desk clerk’s role is much more than just handing out room keys. 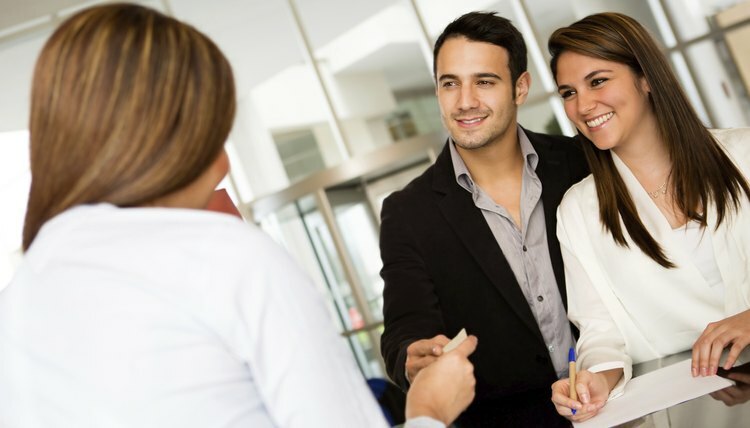 The primary responsibility of a front desk agent is to greet guests and get them checked into rooms. While many guests have reservations, some customers will be walk-ins, so you need to be able to work with the hotel’s reservation and booking system to follow established procedures for either scenario. Getting customers checked in typically involves confirming reservations and the guest’s identity, and taking payment. For guests checking out, your duties will entail noting the guest’s departure and settling the bill. Beyond those front desk duties, officers are customer service professionals. They are expected to know the property inside and out, so they can direct guests to their rooms and provide information about amenities and services. A knowledge of the local area is also important, as guests will ask the front desk for information about restaurants, activities and services if no concierge is present. Front desk workers are also called upon to handle guest requests and issues. And finally, depending on the property, front desk agents may have to handle other duties, such as providing gifts to VIP guests, organizing information centers or helping guests with travel arrangements. In general, most hotels only require a high school diploma or equivalent for front desk roles, which are typically entry level positions. However, experience in the hospitality industry or customer service is often desired, and a college degree is usually required to move into management roles. Some high schools offer the Hotel and Tourism Management Program, created by the American Hotel & Lodging Educational Institute, to prepare students for a career in the hospitality industry and eventual certification in hospitality management. Basic computer skills are a requirement, as well as organizational, multitasking, and communication skills. Expect to receive thorough on-the-job training. Front desk officers work in hotels, motels and resorts. Small, independently owned accommodations like bed and breakfast inns, as well as some campgrounds and recreational facilities, also hire front desk staff to handle receptionist duties and customer service. Some of these roles are seasonal, depending on the location of the hotel. Hours can be unpredictable in the hospitality industry, as lodgings are typically open 24 hours a day, seven days a week. Front desk clerks can expect to work nights, weekends and holidays. 20+ years of experience: $27,000. Overall, the growth in this field is slower than average, at about 4 percent. However, because turnover is high as officers move on to other roles when they gain experience, there are generally jobs available in this field. Hamlin, Kristen. "Job Description of a Front Desk Officer." , https://careertrend.com/about-6542752-job-description-front-desk-officer.html. 27 December 2018.